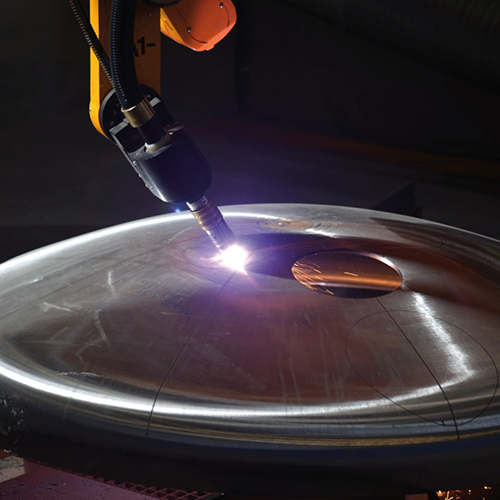 In order to process these huge domes quickly, fully automatically and at extreme precision, it is necessary to determine their shape and exact position within the production line. As the pure CAD data of the dome often differs by several centimeters from the actual dimensions, the 3D profile of the covers is measured before processing using scanCONTROL 2900 laser scanners. The exact dimensions are then determined from the 2D data generated by the scanner which is connected to a 6D scanner position system. The scanning process is performed at high speeds up to 60 m/min. Therefore, a reliable hardware trigger is required to obtain the real shape of the target. Its compact design, integrated electronics and speed make the MicroEpsilon laser scanner suitable for inline integration. In addition, high performance scanners achieve a high repeatability of 50 µm/m even with different reflective properties of the metallic test objects.